I was thinking about file folder game organization and I thought I would share a fun (and cute) idea for displaying your file folder games! Enjoy the tips! To help students know which game they have played, use the checklist below. Simply fill in your student roster on the left side column. Then, make sure your file folder games are numbered on the outside. As students grab a game to take to a spot in the classroom, have them place an X or a check mark in the right spot. 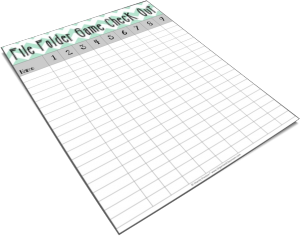 Want your own free File Folder Game Check Out?